Having the ability to extract up to 21L daily of moisture, the Inventor 20L Dehumidifier is more than you could hope for. This great solution is easily able to battle moisture in large spaces. 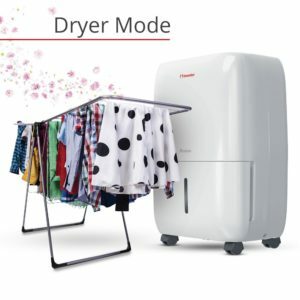 It offers an Ionizer, laundry dryer, timer and other functions that make moisture control a breeze. Transport your machine easily anywhere in the home by simply pushing your dehumidifier on the casters attached to the bottom of the unit. Energy saving model that can extract up to 21L of moisture daily. Easy to use control panel that also features a timer function. Casters that allow for easy transport throughout the home or office. The Inventor 20L Dehumidifier is a powerful machine that is found in the middle of the line of Inventor products in terms of extraction. It is capable of 21L per day of moisture removal which is ideal for larger spaces. In addition, it is also known for its low energy consumption. The Inventor PR1-ION21LBS features an Ionizer, Smart Dehumidification settings, Laundry Dryer, Turbo setting, Timer, Continuous Dehumidification and an auto-restart function. This unit is capable of being used while drying laundry or attempting to keep the furniture from being damp. It is also powerful enough to be useful after the devastating effects of a flood or water leaks throughout the home. The extraction capacity of this model is up to 21 L of moisture daily at 26.7°C and 60% relative humidity. It is perfect for use in larger spaces or in an area with mould and mildew issues. It can also extract and eliminate unwanted moisture in the air and preventing dampness and mould from occurring. This machine will also enable you to dry your clothing faster. Simply place wet clothing inside of a small room while you are using this function. Then, the Inventor 20L Dehumidifier will extract the moisture from your clothing and will also be effective at removing any additional dampness from the air. You’ll find that the clothing has a new freshness after using this function as well. You can expect that the room will stay dry through the entire process. If you would prefer immediate drying action, be sure to use the Turbo setting. For best results, you’ll want to ensure the air flow is directed straight at the clothing you wish to dry. The water tanks on the dehumidifier hold up to 3L. I like that when the tank is full, you’ll hear 8 beeping sounds and an indicator light will also flash to alert you. After that, it automatically shuts off. The tank also features two handles that make it easy to manoeuvre and a clear window so you can see how high the water level is. When you are ready to clean the filter, it can be found behind the front grill and is easy to remove. You don’t need to change this filter, a simple cleaning with a damp cloth once a month will do the trick. Just be sure to dry it completely before you put it back into the unit. For lower power consumption and an increase in savings on your energy bills, you’ll enjoy the Smart Dehumidification options. The Inventor 20L can automatically select the ideal moisture level based on the room’s temperature. The digital control panel allows you to manually adjust the desired humidity range if you wish. There are setting for 35-85% and there is also an option to indicate how many rooms it is being used in. You can easily adjust the desired humidity in increments of 5% at a time. When your room reaches the desired level of humidity, the unit will automatically shut down to save on energy. The LCD display will show you the current settings and alert you of any errors occurring. In addition, you can always use the timer if you want to schedule the operation, which is another way to lower energy costs. The timer is capable of being set up to 24 hours at any one given time. The compact dehumidifier stands on swivel casters which allow for easier portability. You no longer have to carry your unit from each room. Instead, simply push it with ease by using the top handle. If you don’t want to worry about emptying the tank, you could always opt to use the continuous hose function instead. Simply connect the unit directly to a drain and you are set to tackle those difficult projects. If you are using the dehumidifier in a large space or have troublesome mould, this is a great option. It would also be perfect if you are looking to use the Inventor in areas you don’t visit often such as your shed or garage. Depending what mode you are running the dehumidifier with, you can expect it to be as loud as 47dB. While that seems slightly on the louder end of the spectrum, many of the functions run at much quieter levels. The machine’s oversize is 35 x 23.8 x 51 cm, which is relative to the EcoAir DC202 dehumidifier which is also capable of extracting 20L per 24 hours. The weight is 12kg which is also comparable to similar size models, but with the casters attached, you shouldn’t need to pick up the unit to transport around the home. If you have larger rooms or need to remove mould, the Inventor 20L dehumidifier would be a great choice for your home. Between the quiet operation and effective extraction capability, it provides a speedy way to rid your space of mould and moisture. If you are looking for something smaller and more compact, you might be interested in the Meaco DD8L Portable Compact Dehumidifier instead.